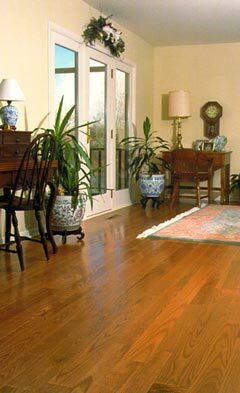 Rock Solid Hardwoods warranties all hardwood floors for a period of one year from the date of installation. This warranty insures that the installation process is done according to National Wood Flooring Association industry standards and all guidelines of NWFA are followed. If a defect occurs as a result of improper installation, Rock Solid Hardwoods will repair the defect or replace that area of the floor at our option. Rock Solid Hardwoods warranties all materials to be as represented in contract forms carrying all manufacturers warranties expressed or implied. Customer verifies that stain, if used, is the proper color chosen in contract once applied to floor sample area. Customer verifies that finish sheen to be used is either gloss, semi-gloss or satin before final finish coat is applied. If wood floor is pre-finished floor that the stain and sheen are approved on job site before the installation process begins. Customer will perform the above criteria in a timely manner as not to impede the finish process. Failure to confirm choices will void this portion of warranty. Rock Solid Hardwoods does not warranty wearability of finish, seasonal shrinkage due to low moisture content or shrinkage due to excessive standing water on floor.